Voter Guide for the November 6, 2018 General Election, including guidance on the Constitutional Amendments. Pasco County voters: In every race, we try to select the candidate most likely to represent the conservative, Constitutionalist, limited-government grassroots. 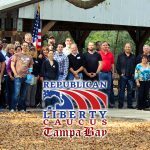 Hillsborough County voters: In every race, we try to select the candidate most likely to represent the conservative, Constitutionalist, limited-government grassroots. Pinellas County Voter Guide for the August 30th 2016 Republican Primary.